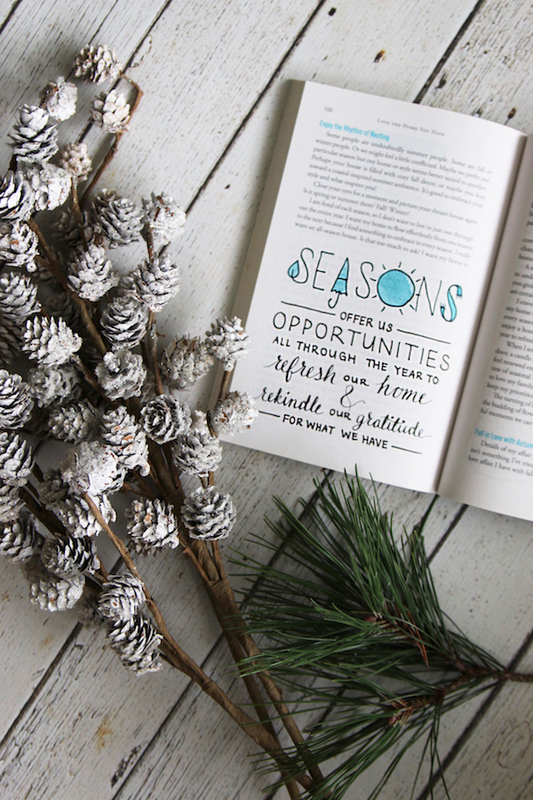 Love the Home You Have: Simply Inspired Holiday Series! Are you feeling inspired already for the holiday season, or are you slightly overwhelmed (or both!) at this point? Or maybe like me you are just in denial. I’m excited, but also wishing our kitchen would be done in time for Thanksgiving dinner and that I wouldn’t be Christmas decorating around a heavy kitchen sink in a box on the dining room floor. Isn’t that how it goes though? Most of us don’t have the perfect house or perfect circumstances for the perfect holiday. Even if you are in your sweet spot in life right now, expectations for what this season should look like can sometimes distract us from what we really want it to be. I could hardly believe it when my Instagram feed started filling up with homes fully decorated for Christmas already on November 1 (and before)! That feels early even for me (See my post from the past when I was defending having a tree on Thanksgiving!). This series will be designed to inspire a little more joy in the season for all of us, no matter what shape or size or state our home is in this year. I’ll share simple practical ways to transform your home, heart and holidays. It isn’t just about decorating and gift giving (although I’ll offer lots of inspiration for that! ), it’s about all the ways we can start savoring this season at home, right where we are. Love the Home You Have: Simply Inspired Holidays kicks off here on The Inspired Room this Monday! As a free gift from me to you, you can download a copy of a “Seasons” art print, based on the one featured in my book photo (above)! You’ll find various sizes and other artwork options right here. Enjoy! Ha, yes! So many decisions! Glad you’ll be here to find some inspiration, even if some ideas have to wait. I know the feeling well! To me, Christmas is in December! – not in November and certainly not in October …..
Can’t wait to read your inspiration for the holidays! I am trying to simplify and not be so overwhelmed this year so I can enjoy this special time of the year with my family and friends.. Yes, I’m with you on that! Glad you’ll be following along. Hi Melissa, I think with all the uncertainty in the world right now we desire to find peace at home. With holiday decorating (early this year) it brings us joy and coziness. Fills our hearts with warmth. Hoping you get your kitchen sink off the floor ASAP! Love the round window idea. I have always loved them. I can’t wait to see what Table you get for your cozy breakfast banquette corner. Happy Holidays! That is such a good point, it really does bring joy and peace to create a sense of warmth and festivity in uncertain times. I’m excited to get started!! I’m looking forward to it! We’ll be away over Thanksgiving and so I am going to get some of my garlands and lights up the week before, so that when I return, it will be Christmas in the house! (I have a ladies tea four days after I return, that I am responsible for as well!) This is how I will be able to enjoy the season and keep my focus on the Reason for the season without stress! I do a natural style decor for Christmas, I don’t have snowmen, or santas etc, so it not theme-y if you know what I mean! Can’t wait for the series! A very dear friend gave me your books Love the Home you Have & The Inspired Room for Christmas last year. I am having a hard time loving the home I have at the moment for various reasons. We started working on that in the spring. We replaced the 4 bedrooms carpets, painted those same bedrooms, painted all of our hallways and the stairway and had crown mouldings added to the bedrooms and the upstairs hall and stairway. Got rid of all the old furniture except our bedroom furniture that was to be replaced and our furniture to become the first guest room. Had to put buying furniture on hold, so we have no where to put the “stuff” that came out of the old furniture. So now, in the lovely, “new” and fresh rooms, we have boxes and tubs just sitting there. Now they are starting the outside of home on Monday. New siding, new light fixtures, new door, new shutters, new paint scheme, new portico, etc However, we can’t fix our side porch off the kitchen and our old deck is coming down (not safe) and since the next phase will include a sunroom and screened in deck across the back of our home, we are basically just putting a landing with stairs to the ground to replace the deck as it sits so high off the ground. So depending on how long that takes, I’ll be dealing with trash and disarray. Hopefully it will be done before Thanksgiving but I’m praying that it is done before Christmas. At least when this part is done, it should be something tangible I can look at (through a yard that definitely needs much landscaping). So as you can understand, it is hard to love the home I have (plus there is a private reason I don’t love the home I have that I don’t’ want to share publicly). Anyway, I love all the advice and easy ideas you share to help us love our homes, and can’t wait to see what you share with this series. With parts of my home in disarray, I can’t wait to read some easy things I can do to try to love the home I have during the upcoming holidays!!! Thank you, Jennifer. I so relate to how you must feel! Hang in there :). So glad you’ll be following along. I need the inspiration myself so I’m excited to get started. We all need to remind ourselves, especially this time of year, what really matters! I’ll be on board to read, and be inspired, by your wisdom. I need some new inspiration for holiday decorating and ideas to make it a special season this year, looking forward to your series. I can hardly wait…..thank you so much! Just downloaded a bunch! Such good stuff! One Holiday ata time…PLEEEZE! I hate hearing Jingle Bells in the stores when shopping for 4th of July decorations….it really burns me out too quickly. It’s too warm to even think of Christmas until after Thanksgiving, anyway. Then I go crazy and can’t get it together fast enuf! It was a gorgeous 82 degree fall day here and we spent it at the beach…THEN we went over to Home Depot and purchased a new pre- lit Christmas tree ( we got rid of our old one when we moved 6 mo. ago. ) We put it up to check the lights…they worked! We now have our un decorated Christmas tree sitting in our living room (3 weeks earlier than usual!) simply because we’re too lazy to take it down just to put it back up in a few weeks! lol. Not to mention that it’s absolutely gorgeous,..71/2 ft tall gently flocked and glittered with real pine cones. I kill me.. 😄😄😄. We’ll wait till after Thanks giving to decorate it. After all….it’s only November 4 th. Ha! THAT sounds WONDERFUL! I left one of our white birch type trees up ALL YEAR ROUND because … it’s so pretty with the lights on! It’s the little things. And I often have a tree up at Thanksgiving, not necessarily decorated, but just because it is so pretty to look at. One year we cut down a gorgeous giant real tree and set it up in our living room but we never did get around to decorating it (we had another tree decorated elsewhere). Trees are just festive and fun, I’m with you. :-D You will get to enjoy it a few extra weeks and I’d say there’s nothing wrong with that. IDK, it’s so hard for me to get into it until after Thanksgiving. I feel we rush things too much. Last year we were in the midst of our own kitchen remodel and all I did was put a wreath on the mantle and called it a day and was happy to do it. With all of the drywall dust it just wouldn’t have made sense to do anymore. Was perfectly content because I knew it would all be worth it and it certainly has been! Learning to love the home I’ve been blessed with. We’ve been in it about a year now. It was decorated by its previous owner very 80’s with pink in every room and floral wallpaper, too. So we’ve been slowly attacking it room by room. But I’m finding the furniture and decor I had from my old home just isn’t my style anymore. I’d love to unload it and get new pieces but my husband just thinks it’s a waste of money to do that. So, I’m learning to repurpose some things and paint other things. I love to frequent garage sales and thrift stores and even craigslist. Finding my new style little by little. Thanks for the inspiration! Be blessed.